Sony is making a new PS Vita. It's lighter and slimmer. You've seen the promotional images, sure. But what's it actually like? Gamers in Japan give their opinions. Sony rolled out kiosks for the slim PS Vita in Japan so gamers can get a hands-on with the revamped machine. As previously mentioned, the new Vita is twenty percent thinner and fifteen percent lighter. It is also outfitted with a 5-inch LCD screen, which replaces the OLED display in the current model. Today, Sony revealed a new PS Vita in Tokyo. It comes in new colors, too. Twitter user @HIKALUKE, who got his hands on the new Vita, remarked that it was thinner than imagined, adding that the reverse side uses a smooth silicone rubber style grip that feels nice. Another Twitter user, @Yottra, said that, of course, dark areas on the screen seem to look better on the current OLED screen. However, that doesn't mean the new LCD looks bad—it doesn't mean that in the least. 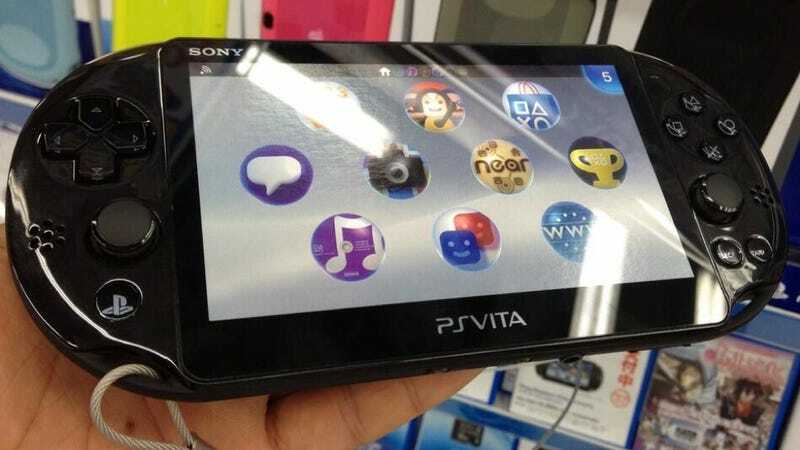 @Yottra said the new PS Vita has a "very fine LCD panel," adding that the new Vita "certainly is thin!" It certainly is. Twitter user @rorikonnane also said that the new Vita is "considerably light."